The name of our 43-foot sailing yacht echoes the tranquility we would like to offer you during one of our scenic cruises. She features a large, sun deck to lounge on and a comfortable cockpit with a hard top cover for that ever important shade. 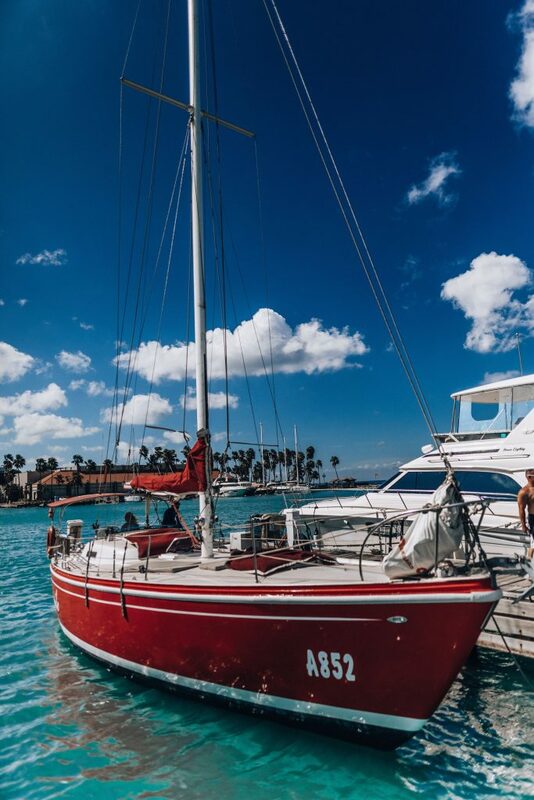 Allow us to show you an authentic sunken shipwreck on one of our private sailing trips, or take you off the beaten track to more secluded places around Aruba, such as our private reef island where you can enjoy some of the most colorful snorkeling available locally. Mike’s reef at Spanish Lagoon is in fact named after Capt. Anthony’s father, who started the family sailing tradition more than 36 years ago. Not to be missed is the now-famous Dutch Pea Soup lovingly prepared by Captain Anthony’s mom for the lunch cruise to the south side. We provide you with all the snorkeling equipment you need. No worries if snorkeling is a first for you – all of our snorkeling cruises include free lessons to make you feel at ease in no time – there’s nothing to it! Once you’re in and have seen all there is to see, you won’t want to get out of the water! On our trip to the south side we offer drift snorkeling which is a very unique way of snorkeling, one simply floats along with the current above the coral reef teeming with tropical fish. All trips now depart from the Renaissance Marina in Oranjestad. We are across from the Crystal Casino (view map). This is right next to the Atlantis Submarines dock. Look for the red boat at the end of the dock. Please be there 5 minutes before each trip for check in. Souvenir T-Shirts and hats are available on board. Gift certificates are available upon requests.